Settlement in the San Antonio area dates from the early eighteenth century when explorers crossed the Rio Grande and began travelling though the lands north of Mexico, with the aim of extending the new Spanish territories. Besides the acquisition of new land, these pioneers also sought to spread the Catholic faith - new villages were based around a large church with other buildings for storage and living quarters, which together with cultivated areas for crops and animals were enclosed in a high protective wall, to ward off attacks from unfriendly groups of roving Apache and Comanche Indians. The whole compound was termed a mission, and several dozen were built across south Texas, always near a river; as well as the San Antonio, they were constructed along the Rio Grande and Nueces, and further east along the Neches and Angelina. After the new territory was secured, the missions became important links in the supply route to lands in the east that were being threatened by French insurgents from Louisiana. Texas Missions map (76 kb): Spanish Missions In Texas, 1659-1795. 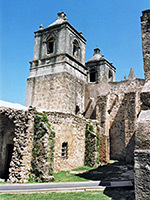 In 1718 Mission San Antonio de Valero was established along the San Antonio River; it was renamed The Alamo at the start of the next century and received enduring fame in 1836 at the culmination of a period of fierce Mexican attacks during the Texan War of Independence, when around 180 defenders, made up of settlers and native Texans, held out for 13 days against up to 5,000 enemy soldiers before finally being defeated. A second mission, San José, was founded nearby in 1720, and three unsuccessful communities from the Neches River in the east were transferred 10 years later. 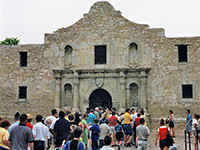 A fort, a village and an irrigation system with dam and aqueduct were added soon after, and the communities flourished, gradually becoming augmented by other development and forming the city of San Antonio. 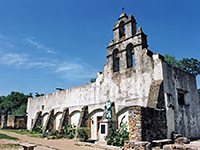 The five San Antonio missions survive intact and the southernmost four are protected as a National Historical Park, which incorporates various sites and tracts of land along the river connected by the Mission Trail, a 12 mile route along city streets that when complete will link The Alamo in the centre with Mission Espada, southernmost of the 5 churches. Outside the downtown area, the San Antonio River occasionally floods but usually has low water levels and is not particularly attractive. It is surrounded by a half mile ribbon of grass and woodland at either side; beyond, the suburbs of the city have extended most of the way south although not close enough to disturb the tranquil atmosphere of the missions, four of which are still used for regular church services. There are no campsites within the historical park, and because it has an urban location, not much prospect of any free overnight parking anywhere nearby. Two hotels within a few miles of the southern end of the mission trail (near Mission Espada) are the new Holiday Inn Express Hotel San Antonio-South and Motel 6 San Antonio Downtown/ Alamodome (see map), while there are many properties near the north end such as Holiday Inn Riverwalk, a few blocks west of the Alamo.